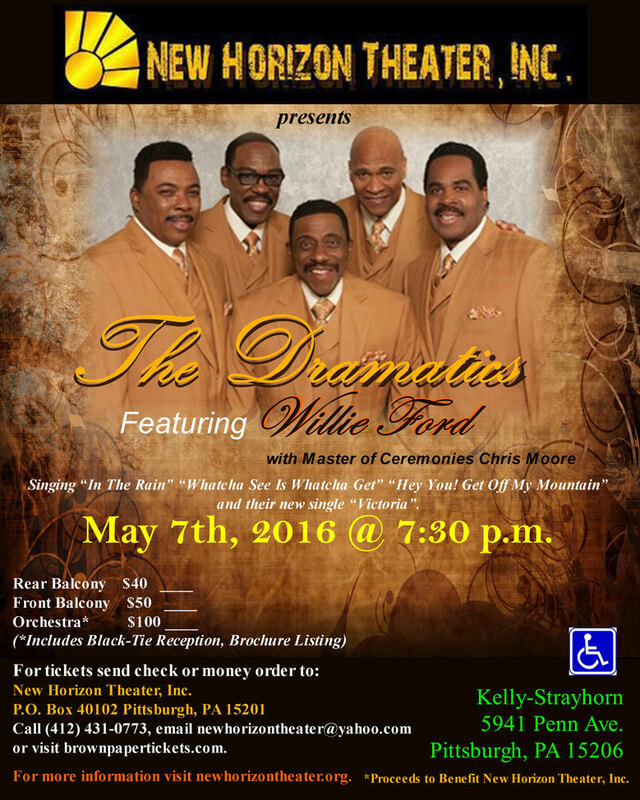 New Horizon Theater, Inc. presents The Dramatics Featuring Willie Ford with Master of Ceremonies Chris Moore May 7th, 2016 @ 7:30 p.m. Kelly-Strayhorn, 5941 Penn Ave. Pgh, PA 15206! NEW HORIZON THEATER, INC. presents The Dramatics Featuring Willie Ford on Saturday, May 7, 2016, 7:30 P. M. at Kelly-Strayhorn, 5941 Penn Avenue, Pittsburgh, Pennsylvania 15206. Some of their familiar tunes are "In The Rain" "Whatcha See Is Whatcha Get", "Hey You! Get Off My Mountain" and their new single "Victoria". Willie Ford is the only original member of the Dramatics still performing today over 45 years of being a Dramatic. 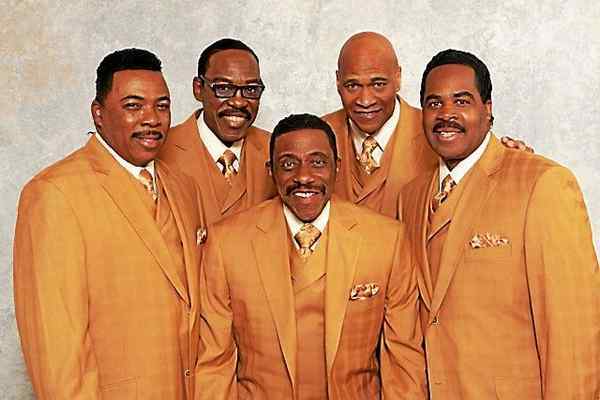 Willie Ford joined the original cast as the bass and lead vocalist of the group in 1969, teaming up with Elbert Wilkins, William Howard, Larry Demps and Ron Banks. At present, Michael Brock, Greg Alfons Finley, Ricky Littleton, and Doughlas Gaddy comprise the other members. This R&B vocal group was formed in Detroit in 1964. The Dramatics were a typical 60s stand-up vocal group, specializing in romantic ballads, but ably made the transition to the disco era in the late 70s with aggressive dance numbers. They made their debut on the charts with a minor R&B hit in 1967, 'All Because Of You', which, as with all their releases in the 60s, was issued on a small Detroit label. Around 1968, the reshaped quintet's fortunes flourished when Detroit producers took command of their career and the group signed to the Memphis-based Stax Records in 1971. US hits with the label included 'Whatcha See Is Whatcha Get' (R&B number 3 and pop number 9, 1971), 'In The Rain' (R&B number 1 and pop number 5, 1972) and 'Hey You! Get Off My Mountain' (R&B number 5 and pop number 43, 1973). The Dramatics were reunited in the late 80s and continue to the present day, keeping up a busy touring schedule and occasionally releasing a new studio album. Their grasp of superior soul remains as sure as ever. Today's group is led by Willie Ford called The Dramatics Featuring Willie Ford.